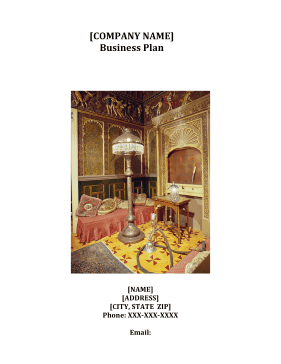 People specializing in antique sales, vintage collectibles and interior design can plan and organize their internal operations with this free, printable business plan. [COMPANY] is a sole proprietorship, 100% owned by [NAME] and [NAME]. [NAME] has a Degree in Interior Design and has over three years experience in operating an antiques store. The Company sells antiques, collectibles, shabby chic furniture, primitives, revamped painted furniture and home decor items. We pride ourselves on the personal service to our customers and the warm, inviting and friendly environment we have created for a truly unique shopping experience. Our store has a great variety of products at a fair price. • Purchase the building the store is located in and begin building improvements for more efficiency in building space. • Purchase a surveillance system to cut down on theft. • Purchase an Office Computer for more internal efficiencies. • Upgrade the workshop for refurbishing and add a spray paint booth. • Develop and launch our website and EBay store. • Launch our Advertising Campaign and attend Trade Shows. The mission of [COMPANY] is to provide a desirable product line at a fair price in a friendly, warm and inviting retail environment to shop in. To provide a personal service - If we don't have it, we will find it, fix it or build it.